Watch my Table Top Review for the Beretta Mod. 84 FS CO2 Blowback BB Pistol. Finally, a field test video for you and I thought I would start off with the new Umarex Beretta Mod. 84 FS CO2 Blowback 4.5mm BB Pistol. This replica BB pistol is fully licensed and is a very decent operational replica to boot. It has a full size drop out metal magazine with blowback operation, a working slide catch/release and safety along with the ability to be easily field striped. Did I mention it's pretty much an all metal gun? So this video is mainly about the performance and overall I was very happy with how the compact Umarex Beretta Mod. 84 FS shot for me. Even on this somewhat cool day, my average fps came in just a smidgen higher than the claimed 360 fps from Umarex. I was a bit surprised at the slightly heavy single action trigger but it didn't seem to effect the accuracy at all as I got about a 1.5 inch 10 shot group from 30 feet away using a semi rested position. You can even coax out around 100 shots per CO2 if you space your shooting out a bit and let the CO2 warm up between magazines. 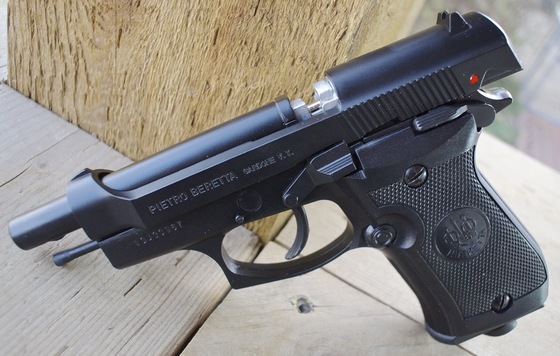 All in all, if you like the Beretta 92 FS styled pistols but perhaps want a more compact version with good overall fps and accuracy along with licensing and quality build. Then for sure pick your self up an Umarex Beretta Mod. 84 FS CO2 Blowback 4.5mm BB Pistol.